There were three minutes of normal time remaining at Celtic Park on Thursday and the air was rent with noise, fear and anticipation - the staples of a stirring night. The 1-1 stalemate with Ajax was the doomsday result that was taking both teams out of the Europa League. Celtic had a corner and they needed a goal. Stuart Armstrong strolled over to take it and the big men moved into position in the penalty area. Cue the volume levels ratcheting upwards. Cue Mikael Lustig, Dedryck Boyota, Charlie Mulgrew and Jozo Simunovic - none of them a millimetre under 6ft 2in - assembling in the Ajax penalty area. Piling so many men forward was a risk that Celtic needed to take. Failing to get the ball anywhere near them was a blunder that cost them the match. Instead of swinging in a cross in the hope of one of his team-mates getting on the end of it, Armstrong went short to Scott Allan. As a piece of thinking, it was death-wish stuff. Allan was under surveillance by two Ajax men, so why give him the ball when your giants are poised and ready in the box? As soon as Allan got it, the Ajax players were on him, ransacking him of possession and breaking free. Celtic still had six players in the Ajax penalty area as the visitors sped away for the winning goal. Armstrong had taken out the lot of them with his short corner. It was a calamitous moment in a European season that has brought so many. It was yet again a night when Celtic had the lead and then cast it to the winds. They led 1-0 and lost 2-1. Against Fenerbahce, they led 2-0 and could only draw. Against Ajax in Amsterdam, they led 1-0 and 2-1 and failed to win that one as well. It goes back further. Against Dinamo Zagreb last season, they were up 2-1 and lost 4-2. They led 1-0 against Astra and drew 1-1. They led 1-0 and 2-1 against Salzburg and were pegged back for 2-2. Against Maribor, they were a goal up and drew. Against Legia Warsaw, they scored first and lost 4-1. Ten times they have gone ahead in European games and 10 times they have lost the lead. 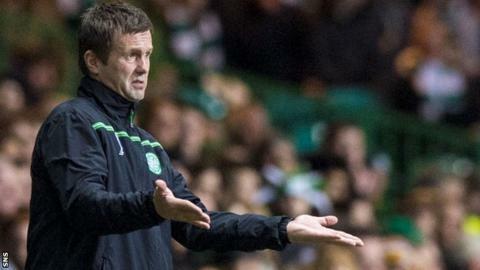 Ronny Deila is there to grow this team, but it's not happening. Nobody is saying it's easy, but in European competition they're not learning, they're not winning, they're not moving forward. They're going backwards. In the wake of Celtic's exit on Thursday night, and with a record of no wins from five games and an average of just north of two goals conceded per match, Deila once again tried to sell a vision of the future that flew in the face of the present. The Celtic manager remarked that, yes, his team weren't good enough for European football this season but that they would be ready next season. Not for the second-tier stuff, he stressed, but for the elite level, the Champions League. No doubt he feels he had to say it, but if he truly believes it then Deila needs to join his assistant, John Collins, in the land of the self-deluded. Collins, metaphorically, departed for that place the moment he claimed that Celtic were better than Molde over two legs, the fact that the 180 minutes finished with an aggregate score of 5-2 to the Norwegians bizarrely doing nothing to dissuade him from his view. It's true that Celtic were missing an entire midfield on Thursday, but this kind of implosion happens when they are at full strength. That missing midfield were the ones who, in part, plunged Celtic deep into trouble in the first place. One of their replacements, Callum McGregor, performed better than some of the absent and underperforming senior players might have done, scoring early and working tirelessly. It was a bitter irony that McGregor gave away the ball for the first Ajax goal and that Allan - so impressive in his passing when he came on - gave it away for the second. They'll beat themselves up over that, but they shouldn't overdo it. They might well be part of the solution, not part of the problem. Leigh Griffiths was another one who chastised himself for missing some good chances, principally the one beautifully laid on by Allan 16 minutes from the end. Griffiths took to social media to apologise for what he called his "shocking" performance. Fair enough. Griffiths played poorly, but he's not a machine and he will have bad days and weeks. Celtic have left themselves without a back-up. They have somehow arrived in a place whereby they have one credible striker and, if that one striker is missing chances, they don't have another trusted option in Europe. Nadir Ciftci remained on the bench. Deila clearly believes he's not up to it yet. Anthony Stokes was there alongside him. Deila hasn't given Stokes the time of day since August. You get an idea of how threadbare they are up front when Stokes re-enters the frame from his footballing Siberia. There are pockets of good things in this Celtic team. Simunovic looks a fine acquisition and Kieran Tierney is an outstanding prospect, but there are too many frail characters, too many huff-and-puff players who have been over-praised and whose consistency of performance and composure under pressure is just not good enough for European nights. And then there's the manager who is overseeing it. He predicts big days ahead in Europe, but it's a mantra that he's singularly failing to back up. Twenty-five European games played with just eight wins, seven draws and now 10 defeats. Thirty-nine goals have been conceded. In that run, there's been three failed shots at the Champions League and now a winless Europa League campaign. Peter Lawwell, the Celtic chief executive, said last week that he has confidence in Deila's ability to mould this team and drive it forward in Europe. You'd have to say that Lawwell is now in the realms of blind faith.